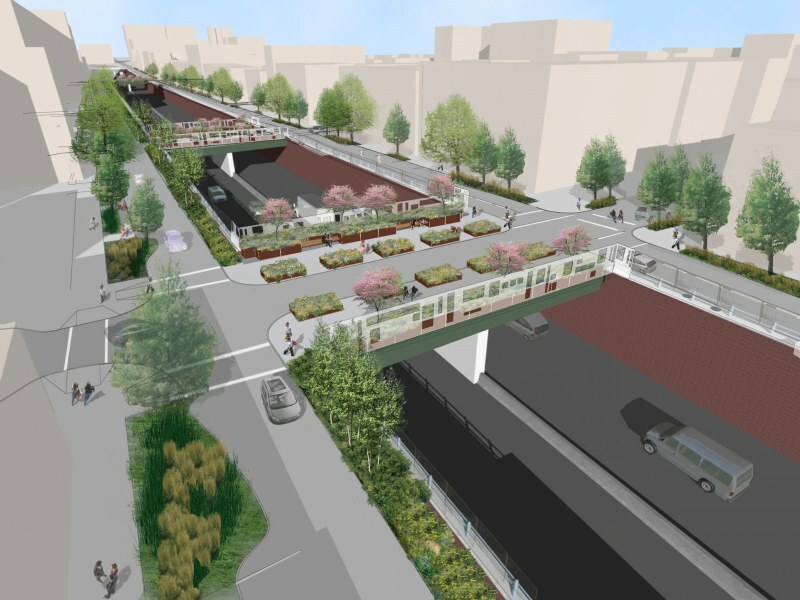 This past year the New York City Economic Development Corporation (NYC EDC) hired New York landscape architects Starr Whitehouse to come up with a three concepts to improve the Brooklyn-Queens Expressway, which currently carves a trench through a community. They recently unveiled their solutions, which help green the neighborhood, provide improved pedestrian and bicycle access and reconnect the divided neighborhoods. Community members were also involved in the design process and let the designers know they would also like to reduce noise from the road, mitigate pollution, and create a connection between the separated Carroll Gardens/Cobble Hill and Columbia Street Waterfront neighborhoods. Read on for a look at each proposal! Starr Whitehouse presented three final concepts in a public meeting to 35 neighborhood residents as well as representatives of city agencies and state and local elected officials. The three concepts propose various degrees of linkages across the trench, the planting of trees, noise reduction schemes, and additional park space. Each concept is progressively more involved (and more expensive), but provides more open space, noise reduction and pollution mitigation. The first concept, called Maximum Green, proposes to reconfigure the existing bridges to provide planter space and stormwater retention in swales for irrigation use. The trench would be surrounded with a plexiglass or artistic wall to cut down on noise from the highway. 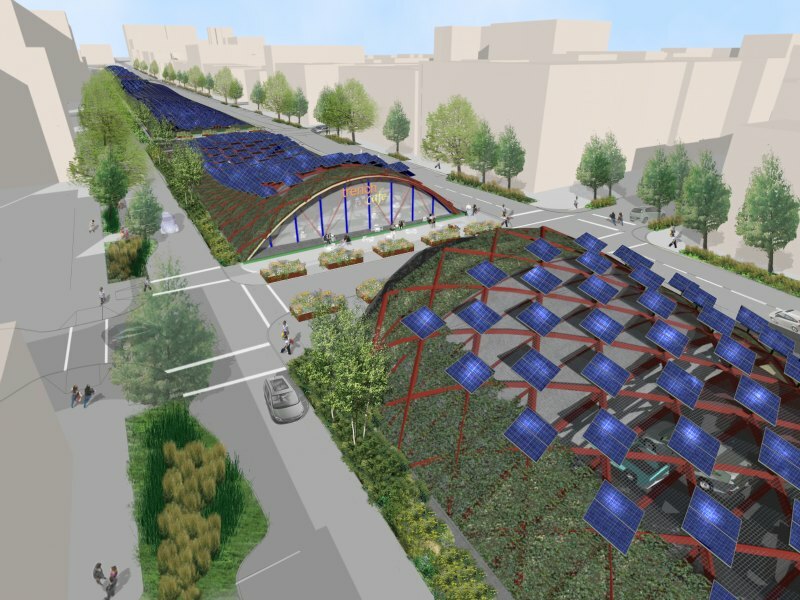 The second concept, called Connections, proposes the same as the first concept, but adds a series of 5 new prefabricated bicycle and pedestrian bridges at cross-streets that were severed by the BQE. Finally, the third and most comprehensive design, called Green Canopy, includes all the traffic calming, planting and pedestrian bridges of the first two and adds a giant plant-covered canopy over the entire trench to cut down on noise and reduce pollution. The steel angle-and-beam structure canopy was designed with the help of Kiss+Cathcart Architects. Additionally, solar panels would cover the canopy to generate renewable energy and space would be created for new shops or restaurants at bridge crossings. Costs for the proposals vary from $10.7 million up to $82.7 million depending on the concept chosen and additional features. Funding for the project has not been allocated nor have any decisions been made. This is a perfect example of how we can integrate distributed renewables into the built environment... In Colorado we now have the Community Solar Gardens Act, which allows for shared ownership of solar energy. This would work well with the sort of design shown here. The first concept is called Maximum Green. It offers a quick fix solution that makes the most of the existing infrastructure. Existing bridges and adjacent streets would be reconfigured to slow down traffic, and planters and stormwater retention swales would harvest and store water for irrigation. This scheme would add almost 1 acre of green space as well as 412 new trees. Noise from the highway would be reduced either through the addition of a plexiglass wall around the entire trench or an artistic green wall. The cost of this project is estimated to be between $10.7 million and $18.7 million. The second concept is called Connections - it includes everything in the first proposal to improve the existing bridges as well plans to provide more pedestrian and bicycle access across the trench. Connections calls for the addition of five new prefab pedestrian and bike-friendly bridges across the trench. Optional elements for this scheme include: acoustic infill panels for the bridges to reduce noise for those crossing; green screen panels that enable vines to grow on the outside of the bridges; solar panels on the roof that could generate up to $12,900 of green energy per year; and decorative LED lighting that creates a visible, identifiable landmark from the BQE below. Connections would help calm traffic while providing improved access for residents at a cost between $30.1 million to $38.7 million. 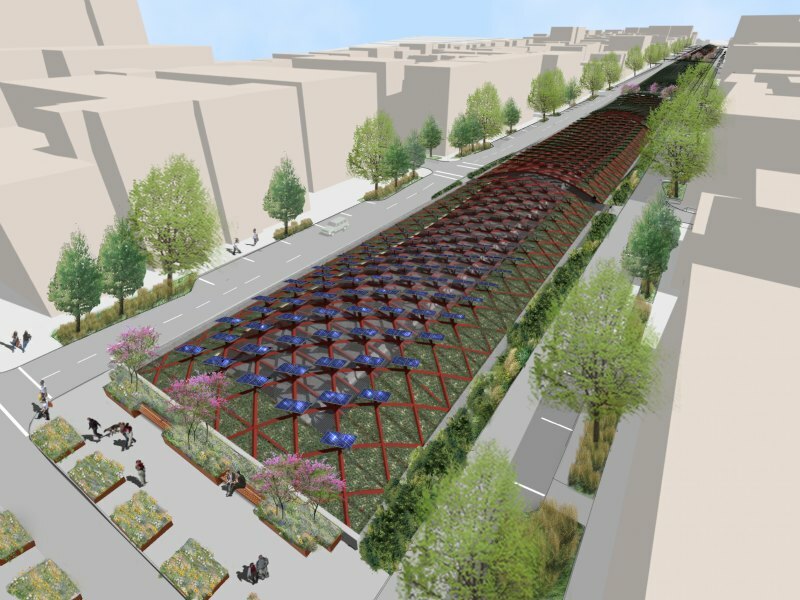 The third concept, Green Canopy, makes use of all the previous design ideas and adds a large steel and vine covered canopy over the BQE Trench. Additional space for retail and restaurants would be made along with improved noise reduction and lots of pollution mitigation. Solar panels on the roof of the canopy could produce over 1 million kilowatt-hours of green energy annually, for a cost between $78.8 million to $82.7 million.